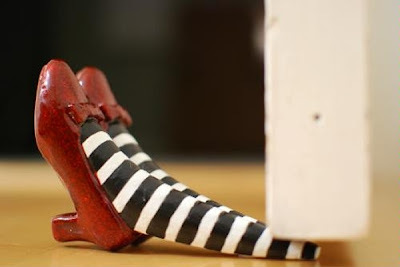 I used to own this Wicked Witch of the East doorstop, but didn't bring it with me when I moved. It was heavy and pretty battered by the metal door in my last apartment, so I figured I could probably do without it...yeah, that was a mistake. I now use a boot to prop the door open when necessary, which is both less effective and significantly less amusing. And it's always important to keep your movers and delivery men amused, after all.